During my senior year of residency, I brought an elderly gentleman to the operating room with peritonitis and a benign-appearing CT scan only to find a belly full of black, necrotic bowel. We closed him up, told his family, and he died peacefully several hours later. When I presented the case at Mortality and Morbidity conference, one of the attending surgeons asked me why this patient had dead bowel. I ran off a long list of pathophysiologic possibilities, and he replied, "You know, Gretchen, sometimes it’s just a way to die." At the time I thought this was strange, but since then I have come to understand what he meant. Patients often come to the hospital when they are dying. Fear of the unknown and pain typically bring them in, and it’s not uncommon for their primary complaint to manifest as a surgical problem – a gangrenous toe, a dead gallbladder. 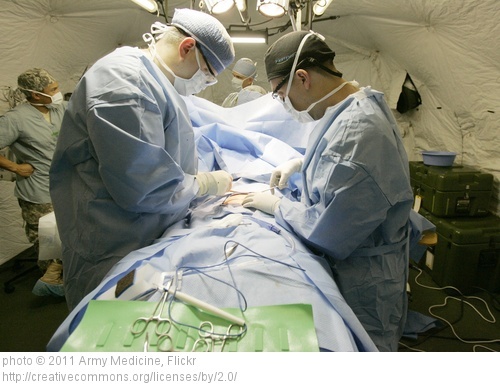 As surgeons, we often step in and operate right before they die. After a string of poor outcomes, a close friend from residency called to commiserate about the next paper he was writing: "The Premorbid Gastrectomy: How I Do It." Although I have angst about gallows humor as a robust coping mechanism, the content here is telling; for many elderly or otherwise frail patients, surgery is not the answer. Clearly this is not the case for all surgical problems in elderly patients, and for those patients who appear to be on death’s door because of their surgical problem, some cold hard steel is probably just what they need. But we must be mindful of the patient whose surgical problem is the final paver on his pathway out; the pneumonia that is the "old man’s friend" may instead present as cecal volvulus with perforation. I told his family that the only treatment to resolve his ischemic necrosis and impending sepsis was an above-the-knee amputation, which I would not recommend because it was unlikely to prolong his life or improve its quality. They were taken aback, and I spent more than an hour explaining to his wife and daughter why cutting off the leg of this once-distinguished World War II veteran right before he died was not a good idea. Families ask, "You mean you aren’t going to fix it?" because they fail to recognize that the surgical problem is a sign of a much larger and inexorable journey toward death. Although the "fix it" metaphor may be a simple way to explain to a young healthy person the need for a complicated operation, it fails to convey the context here where surgery could win the battle but lose the war. I have colleagues who see this as a failure of primary care. They wonder why patients and families are unprepared for the inevitable terminal event and have not considered how frail health predicts a poor long-term prognosis. I suspect there are many reasons for this, not the least of which is unwillingness on the part of the patient or family to tackle these issues before crisis sets in. Nonetheless, at 2 a.m. when an 85-year-old woman with Alzheimer’s dementia, COPD, and acute kidney injury is brought in from her nursing home with toxic megacolon, it is the surgeon who must help the patient’s family understand that she is dying, which is the context for making a surgical decision. How can we do this? First, it is important to be clear with the patient and/or family that you would not recommend surgery. While it would be overly paternalistic to say that surgery is not an option, we can explain that there is a real choice to be made and that palliative care is an excellent plan. Too often, including surgery as an option is interpreted as a recommendation, so it is important to clarify where you stand. Second, for families who insist that the patient would want "everything" done, it helps to clarify what they mean by "everything." Everything can mean anything from "everything that might provide maximal relief of suffering even if it might shorten life" to "everything that has any possible chance to prolong life even a small amount, regardless of its effect on patient suffering" (Ann. Intern. Med. 2009;151:345-9). Third, we can borrow some helpful phrases from our colleagues in palliative care. For example, "Sometimes by prolonging dying, we prolong suffering." And finally, if all else fails, you might try, "You know, sometimes this is just a way to die." This commentary is used with permission from Surgery News Digital Network (www.acssurgerynews.com). What a thoughtful post. As a palliative care NP, I sometmes envy my surgical colleagues who can present clear rationales for why they won't do surgery if the outcome is likely very poor. If only other providers had the same perspective we wouldn't even offer an 88 yo with several end-stage conditions dialysis or send them in for a surgical consult. Thank you for this insightful post. My 97 year old WWII veteran father was hospitalized in july with a bowel obstruction. He was relatively healthy, with progressive CHF. A surgeon offered to remove the obstruction. As I sat by Dad's bedside, I read Stephen Post's article Plant a Rose in The Desert (end of life care). I felt any surgical intervention at that point would not be helpful for my father. That day we were able to place Dad in Hospice Care. He died peacefully two weeks later. The surgeon fully understood our decision, which helped us in that difficult process. The combination of compassionate nursing care, an understanding surgeon, skilled Hospice care and prayer resulted in a peaceful passing from this life. for thirty years I have companioned the dying, young and old. For the elderly, the push for survival and longevity ("We want her to make it to her 100th birthday) too often results in pain and suffering that could be diverted to comfort and peace by intelligent, honest conversations between primary care physicians and their patients and surrogates. These conversations should be done in three steps: in good health, at diagnosis of a life-limiting disease and anytime life-sustaining treatment is approaching--not during a crisis. The award-winning film, "Consider the Conversation: A Documentary on a Taboo Subject" and ABC Television's "The Conversation Project" are useful tools to create educational opportunities. Both offer free study guides and links to free, legal advance care planning forms. Thanks for sharing this! Well said. Thank you for this post! I am so moved by your compassion and clarity of mission. Thank you also for the words "sometimes this is just a way to die." Peace can be the choice when you think you are out of options. That's one reason why I find hospice services difficult; it's difficult being a messenger of death.